I remember ordering this amazing gazpacho at one of my favorite restaurants in my hometown of Upland, CA. Unfortunately, El Gado Gordo closed down several years ago. I remember that the Lynda's Gazpacho had diced avocado and little bay shrimp in it. Add some hot sauce for more kick, and man, it was a great little meal in itself! I am trying to eat a "plant & protein" diet these days in an attempt to drop some weight, and since the weather is so nice lately, I thought of gazpacho for dinner. It was very, very delicious! Dice all the veggies. Put all ingredients in a bowl and give it a few pulses of the immersion blender, but leave it a little bit chunky for texture. 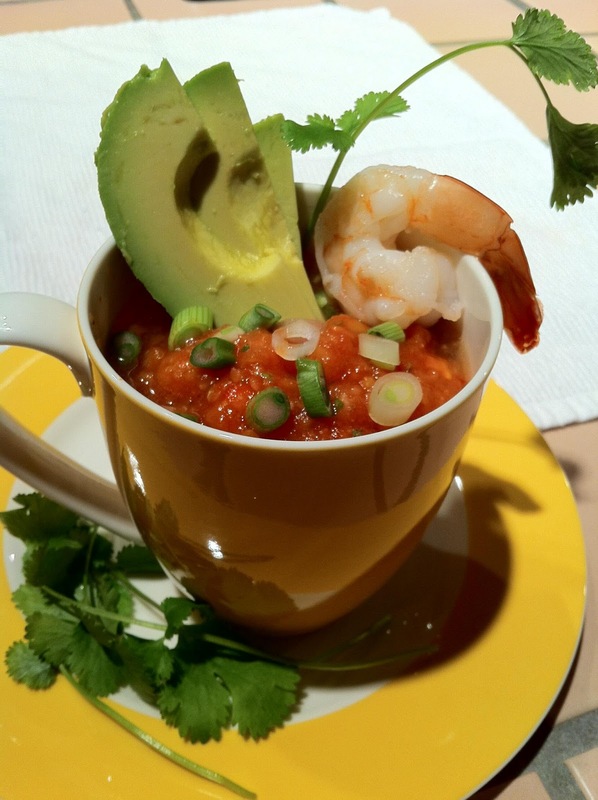 Garnish with your choice of sliced scallions, avocado, cilantro, hot sauce, horseradish & prawns. Or add them all, like I did! :) Maybe even a few tortilla chips would have been a nice addition. Serves 4. Enjoy!